The family Boré have inhabited Domaine du Fresche for the past six generations. 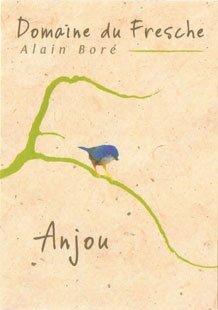 Alain’s grandparents were mixed farmers, growing cereals and raising cattle, both for dairy and for meat, as well as making a little wine. But it was Alain’s father and two uncles who began to focus their efforts in viticulture, and Alain himself has been working at the domaine since 1989. Today he farms a total of 30 hectares of vines, all situated in the commune of La Pommeraye on the south bank of the Loire, and enjoying commanding views over the valley and the river itself. Since 2004, all of Alain’s wines have been certified as organic. The range at Domaine du Fresche is diverse, with Alain making around a dozen wines each vintage. This is a reflection of both the grape varieties planted and the appellations that encompass the vineyards that surround La Pommeraye. The white wines are based on Chenin Blanc, although there is a little Pinot Gris here too (known locally as Malvoisie). As is normal with Chenin in the Loire, the grape is fashioned into a number of different styles which include a Cremant de la Loire (sparkling), a dry Anjou Blanc and, when conditions allow, three individual sweet wines. 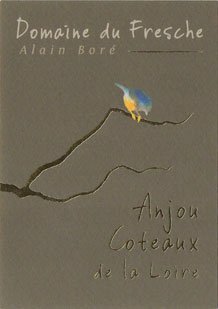 Given that La Pommeraye sits just outside of Coteaux du Layon region, they take the name of the relatively obscure Anjou-Coteaux de la Loire appellation instead. There are only a handful of growers here and production is tiny (in 2008, only 28 hectares were in production), which also ensures that pricing is relatively modest in comparison to its better known neighbor. 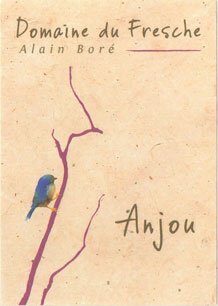 Alain also produces a pair of Rosés, one dry and one demi-sec, using Cabernet Franc, Cabernet Sauvignon and the locally known Grolleau. The three different reds are produced from either Gamay or Cabernet Franc. From 100% Chenin Blanc. Clean, crisp and dry on the nose with some typical notes of apples and pears. The wine is bone dry with a chalky texture on entry and displays a good structure, with a lively apple-like acidity running through the wine. There is a hint of spritz coming from a little residual carbon-dioxide which helps to lift the impression of freshness and acts as a preservative. This is for immediate drinking, but could be expected to age for three to five years. From 100% Cabernet Franc. Very deep appearance with concentrated black fruits on the nose. The palate is very pure, with a focused, juicy acidity running throughout. There is some concentration of flavor, but the overall impression is of deftness and freshness. With its lively, primary fruit this is delicious now, but could be expected to age over the next decade as it looses its red fruit character and takes on a more wild and gamey profile. Very deep, dark and primary appearance. The nose is ripe but not confit. 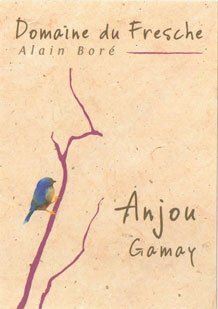 The palate is very pure with the characteristic yeasty freshness of Gamay. Good weight and concentration with good length. This really is designed for drinking within the first two years of the vintage. Enjoy while the wine still has its primary fruit flavors. From Chenin Blanc. The wine contains 80g/l residual sugar and a modest 11.5% alcohol. Rich on the nose with obvious ripeness. There are notes of quince and baked apple. Good structure on the palate with the residual sugar barely noticeable, being balanced out by the crisp apple-like acidity. Although approachable now, this would benefit from a couple of years in bottle.